I have been working out with Aaron for the last couple years through my Fire Department’s fitness program. The program didn’t really click with me until this last fall; I thought of the workouts as a chore and really wasn’t into it. I knew nothing about physical fitness in general and thought I should be spending my time pretending to lift weights. Something changed and I decided it was time to take my personal fitness seriously and had the perfect person there to help guide me on my journey. Aaron is excited about what he does and is always willing to share. Since I started to get in shape I have gone to Aaron with every article I have read about specific exercises, workout plans, and diet tips. He always goes back to “what is your goal”, and helps to decipher what may or may not be a good idea for you based on that goal. I now put in 100% effort during our group workouts and feel like a different person. Aaron also created a personalized workout plan for me to follow and continues to make small adjustments in order to maintain progress. In a little over 5 months of following this plan I was able to lose 9.8 lbs of fat but most importantly gain 10.3 lbs of lean muscle mass. I am all in now; I look and feel like a different person and it drives me crazy when I am not able to work out. Aaron has helped guide me to a place where I can perform better at my job, I feel amazing, and my motivation is through the roof. I have been training with Chris Ransier since July of 2010. At the time, I was training for my first half marathon and he tailored my workouts around speed, strength and endurance. I have competed in sports at various levels and thought I knew all there was to know with regards to proper training, stretching, dieting, etc. From my first training session with Chris, I realized I didn’t know half the stuff I thought I did. When we first met, we sat down and went over my goals, he asked questions including “do I want to add muscle and how much,”” do I want to lose or gain weight,”” what types of food do I like to eat,” etc. When we were done, I had a specific plan/goal in place including target body fat %, lean muscle mass growth projections, a daily/weekly running plan to focus on speed and endurance work, and a diet plan with target calorie intake broken down by carbohydrates, proteins and healthy fats. Each time we do a personal training session he has a workout specifically tailored for me and my goals. No workouts are ever the same so it is hard to plateau and become complacent. I have learned how to properly stretch and care for my muscles to lessen chances of injury. My wife and I both attend the group training sessions once or twice per week. The group classes are a great addition to our personal training. The instructors, Chris and Aaron make the class fun and exciting while ensuring everyone is doing the exercises and movements correctly and safely. The format they run include small group rotation between stations with varied work/rest intervals. This promotes teamwork and a bit of healthy competition. They know how hard to push to make sure you get the most out of every workout and are able to individually modify movements based for personal injury and/or between degrees of difficulty. Overall, it is a very positive environment to be in. Being a part of Rebel Fitness and Performance I have strengthened my physical and technical workout aptitude, I’m in my best shape and most importantly, in better health. I just wanted to say thank you to Aaron and Chris at Rebel Fitness, you guys have changed my life. I have been coming there for about a year and a half now, and I have not only changed my appearance but my lifestyle. I am much more health conscious about what I eat and how I take care of myself. I have lost over twenty pounds and four belt sizes in that year and a half, and I have a regular regiment to my workouts. Thanks to your expertise I have been able to avoid some of the nagging injuries that I have had in the past and be more consistent in my fitness goals. I am a firefighter and the new workouts have increased my stamina and my strength. This helps me do my job that much better and gives me more confidence in stressful situations. Thanks again for all your hard work, in helping me be more healthy, and to be able to live my life better. - He sets realistic goals for you at each step. - He holds you accountable. Be prepared to track your food, weigh in, and write your goals on the blackboard displayed prominently in the gym. The pounds and inches you lose are additional motivation. - You will become the strongest you've ever been. I've worked out my whole life, and I have never been able to do as many pushups, or run this fast... ever. I got back to my pre-pregnancy weight in 5 months, and now I'm in maintenance mode enjoying their classes... and my skinny jeans. I was an active child/teenager. I ran track, cross country, was a springboard diver, figure skater, gymnast, skier, and roller skater. I would sit and watch “Wide World of Sports” for hours. I wanted to be like Dorothy Hamill. I even tried to cut my hair like hers. I was always a thin child/teenager. My “Nani” would always complain to my mother to feed me more pasta. The years passed on and my focus shifted towards school, work, and raising a family. Work kept me busy with its hectic pace and hours on my feet. My child needed my attention. So did my spouse. I was working swing shift and I started making bad food choices. McDonald’s and Jack in the Box were open at Midnight. They took care of my food needs after work. I started gaining weight. I put on 30 pounds over time. I was not happy. In February of 2006, I joined 24 hour Fitness and they offered personal training. I wanted help, support, education, and direction and felt I couldn’t do it alone. I knew I needed a “hard push”. I bought some sessions and started the transformation towards good health and fitness. In 2007, Chris took the helm and started managing my training. I shed the weight and shredded the muscles. With his guidance I resumed running and have completed numerous races ranging in distance from 5K’s to 100 miles. Years later, I’m still getting that “hard push”! Before meeting Chris Ransier, I was working out on my own; cycling in the summer and lifting weights in the winter. Like most folks, I thought I knew what I was doing and how to plan and manage my own workout routine. The result of being my own personal trainer – I ballooned to 202 pounds and had to admit I was really out of shape. I met with Chris in the fall of 2010 and, from the first meeting; I knew that I was working with an expert in health and fitness. Chris started by asking questions (What are your goals? Are you willing to be consistent with your effort? Are you willing to listen?) and, based on my answers, crafted a personalized training program. I lost 45 pounds in the first 18 months and have maintained the weight loss for the last several years. 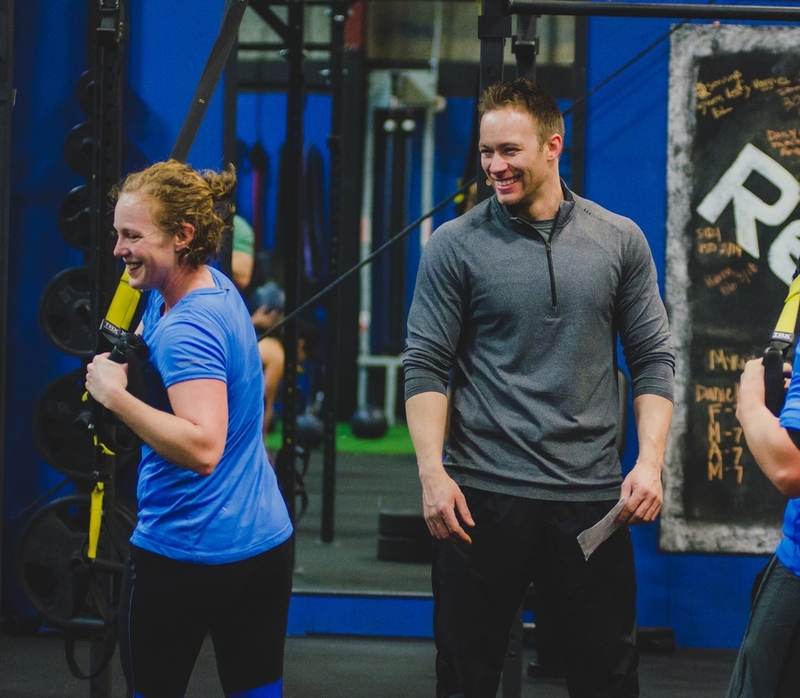 Rebel Fitness and Performance offers personal training sessions, functional group classes and small group training. The energy at Rebel is excellent, the clients are motivated and the instructors (Chris. Aaron and Tyler) are experts in fitness. Over the past several years I have participated in the Big Climb (climb all the stairs in the Columbia Tower), completed the Seattle to Portland Bike ride in one day and completed dozens of other events. If you are ready for change, there is not a better facility than Rebel Fitness and Performance. In 2010 I had three major spine surgeries one of which was a spine fusion. The surgeries weren't successful and thus rendered me in more pain than pre surgery. I ended getting to the highest weight ever as a result of not being active (254lbs)! In October 2013 I asked several of my friends about Rebel Fitness. I got an overwhelming amount of positive feedback about Chris and Aaron so; I thought I’d give it a try. I tried everything else I could think of. I reached out to Chris and told him what I’d been through health wise and told him that I was really nervous to work out for fear that my back would just blow out and I’d be in for yet another surgery. We set up doing two days a week for personal training. I remember having “T-Rex” arms when I started out - I was so sore I couldn’t fully extend my arms! I remember communicating with Chris about this hurting and that hurting yet he was (and is) very responsive and always offered a positive response! I felt good about my workouts and began my body transformation. Chris works really hard at putting workouts together that are challenging and focused on what you need and more importantly what your goals are. When I started out I am ashamed to say that I couldn’t do more than 3 pushups. He saw I couldn’t do more and immediately moved me to a bench where they were I could complete more. Slowly with his close guidance I’m now doing advanced pushups with the TRX system and close grip ball pushups! Chris’s attentiveness to me doing movements or lifting weight correctly is exceptional. Sometimes the movements are complex and he is always there to help even demonstrate it as needed so I can maximize each movement. He’s always keeping my goals at the forefront of each workout and helps push me when I think I’ve reached my end. They have a really cool chalkboard on the wall that’s called the “goal board”. You put your goal up (usually a certain body weight) and put a date that you hit your goal. I’m currently on my 4th goal on the board and proud to say that with his help I’ve hit each one! Not only have I lost a lot of weight but I feel a TON better. To date I’ve lost a total of 50lbs!! I’m able to play sports that gave me trouble before (mainly golf). His knowledge of the bodies muscular systems is very high. Many times I’ve relayed pain or lack of mobility in a body part and he’s quick to help me understand why I’m feeling and what I can do to help resolve it! Both my wife and I train at Rebel Fitness and wouldn’t imagine entrusting our health and conditioning to anyone else! The facility is always kept very clean and they are continually updating the equipment at the gym to help better your workout. Both Chris and Aaron care about YOU. Because I lost so much weight I’m often asked, “How did you do it”? Or “What’s your secret”? My response is and always will be following the plan that Rebel Fitness has put together for me. There is no secret you have to put forth the effort and there is no better place to help you! “Health” means something different to each of us but with the right support and training I believe we can all achieve balance and push ourselves beyond what we are capable of doing alone. I have always been an athlete and committed to regular exercise but after finishing graduate school and starting my career I wanted to ensure a balance with my health and well being and decided to begin personal training in order to achieve this goal and take things to the next level with my fitness. I began training with Chris in March of 2009 and he has helped me accomplish just that. Even after 6 years of training with him, he continues to tailor my program to my specific needs and has helped me progress in my own personal passions such as competitive rowing, distance running, and even to nearly full term with both of my pregnancies. Chris’s support and adaptive training techniques have helped me continue to maintain balance and a high level of fitness, even as mom to two young boys. He continues to challenge me and provide support, with expertise and a personal training style that keep my workouts fun, progressive, and for me personally, therapeutic. I highly recommend Rebel Fitness & Performance to anyone who is interested in finding out what they are capable of achieving with their own health and fitness goals, and for those who are ready, taking it even further. In 2007 we dropped our son off at college. That is when I decided my job as a full time/stay at home Mom was done and it was time to start “taking care of me” so I joined a gym! In 2009 I started training with Chris Ransier & since then I have lost almost 30lbs, 10% body fat & gone down 3 pant sizes! Occasionally someone will comment on my appearance and ask me what I’ve done. Of course I tell them I exercise, but I always think back to the what I ate & more importantly the amount I used to eat and my response always is “I weigh all my food, read labels and track what I eat.” That is the biggest thing I have learned from Chris – yes exercise is important but to see results you need to be accountable for what & how much you put in your mouth! I don’t think much about my age, what I do & the way I look, until one day someone in a group class made a comment about a health issue they were having and he said, “what I have is something a person your age should be having” which really made me think, society does seem to put physical limits on people of certain ages. I've been training with Chris since the end of Feb 2010. I just had my last child and wanted to finally lose the baby weight that I had gained with each pregnancy. My goal was to lose inches in my middle section which is where I normally gain weight. I wanted to be able to wear my jeans and not have a muffin top. I was about 140 pounds when I started working out with Chris. Another goal I had was to tone my arms and legs but not bulk up in muscle mass. Chris has helped me attain both goals. I now weigh between 123 -125 lbs, I have toned my arms and legs without looking bulky and as a bonus, my endurance has increased from the exercise plan that he puts me through. Also, I have never really been a fan of running and since working out with Chris I have participated in several 5K, 8K and 12 K races, have ran a half marathon and did the Tough Mudder this past year. In 2010 I had made a decision to make a life style change. I began working out and eating better. Soon I was on my way to losing weight and exercising regularly. As I reached my weight loss goals, I could never really seem to achieve getting stronger or build my endurance. I also noticed that over time it was difficult for me to maintain my weight loss. As I started to feel like I wanted to give up on working out, a good friend of mine referred me to Rebel Fitness and Performance. From the very first class I could see that their methodology behind the workouts were exactly what I was looking for. Chris and Aaron are both very knowledgeable trainers, but they also helped me get better with my eating habits. I could see my endurance progress and my strength build over time. I went from not lifting any weights at all, to being able to incorporate heavier weight training into my weekly workout routines. I feel more fit, leaner, and stronger than I've ever felt. And I continue to grow and progress with their help. The highlight of all of this hard work was that I was also able to achieve a goal of fitting into my wedding dress after having 2 kids and gaining 60 + lbs each pregnancy. This goal was special because it had once been told to me that it would never happen. It would not happen because someone my size would have a really hard time to get my body to work hard enough. Not only was I able to reach that goal, I've been able to surpass it because of Rebel Fitness and Performance. I joined Rebel Fitness around mid October 2014 and I have loved it since the first day I stepped foot in the gym. I am not going to lie and say that it wasn’t intimidating going to the group fitness workouts knowing that I was super out of shape. However, I knew that I wasn’t there for anyone else but myself. I was so out of shape! I graduated from college in May and realized that I was in the worst shape that I had ever been. Which is a feeling no one should feel at the age of 22! I have never been slim so I was not necessarily looking to join Rebel Fitness to do a transformation. I was simply looking to have a stress outlet and lose a couple of pounds. But…then something amazing happened. I found an amazing gym family. I found some trainers that truly care about my fitness progress. I found some trainers that believe in me more than I believe in myself. Chris helped me start setting goals, which I was worried about because I kind of never set weight loss goals for myself because I used to think “who am I kidding, I am not going to accomplish that.” As the weeks passed, I realized how much discipline and motivation I have gained since going to do the group workouts. I have lost 37 pounds since joining and I am still going strong! I'm super excited to keep pushing myself to the unknown. I have slowly been learning how to embody and embrace the fit lifestyle. My friend and running buddy, Lesley introduced me to Rebel almost 2 years ago when I was trying to get back into shape. I wanted to find a place with challenging workouts, affordability, and accountability. At Rebel, workouts are enjoyably tough and people expect you to show up! I’ve learned so much about lifting technique, using foam rollers to ease the muscles, living a healthy lifestyle (even if it’s a struggle at times), and my own strength. The atmosphere is social, supportive, and motivating, which makes it that much easier to get to group class or open gym before work in the morning. Thanks Rebel! With Rebel, I was able to workout up until I delivered my daughter. In fact, at 39 weeks pregnant, I had every intention of being at my normal 6 a.m. Tuesday morning class, but I ended up going to the hospital instead. Now, there is nothing easy about a natural child birth, but I can only imagine how much harder it would have been had I been sedentary the preceding 9 months. Even better? When I went to my 4 week post-partum check-up, the midwife asked if I had already started to workout because my abs were so tight. Now that’s something to make a sleep-deprived mama feel good! But as I said before, what I love most at Rebel is the community. The other members are my friends, and we go hiking and out to lunch. The women even threw me a baby shower. We run races together and cheer others on as they bike and run races. The members of Rebel are so inspirational, so caring, and so fun to be around. They motivate me, notice when I don’t show up to workout, and hold me accountable. That’s really important when the alarm goes off at 5:00 a.m. and I just really want to press snooze. But I don’t, because my morning workouts are as important as my morning cup of coffee. I have been working with Chris just a few months and have already experienced improvements in strength and flexibility. His knowledge of the body and nutrition is amazing. He listens, plans and follows through. His goals are the same as mine and first and foremost is to achieve them safely. He and Aaron have created a tremendous "family environment" at Rebel. I highly recommend Rebel to anyone who wants to reach a personal goal or improve their life. Every day people are putting in the work to accomplish their goals inside. We are here to help you begin to build your own success story. Take the first step today and before you know it your story will be up here too.